Do you miss those days when you walked into gym class and the teacher told you dodge ball was what you’d be playing? Have you ever watched The Hunger Games and all of a sudden wished you could shoot a bow and arrow like Katniss Everdeen? Ever thought of combining these two sports? Well, think no more! Dodgebow Archery is just that. 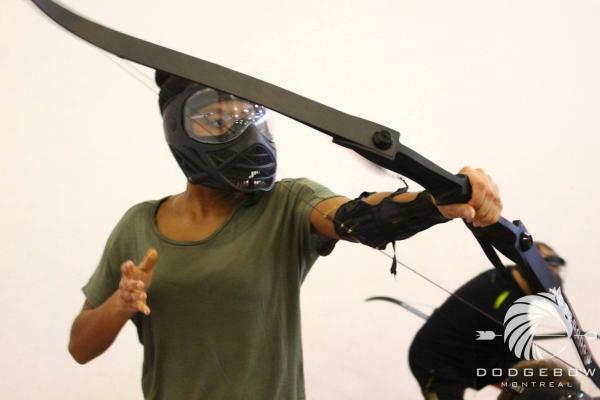 Located in Saint-Henri, Dodgebow lets you relive your childhood while letting you live out your inner The Hunger Games fantasies in a fun and safe environment. It is a perfect “Sunday Funday” activity for families as well as a great Saturday evening with friends. With the help of an animator, 24-36 people can play the following game modes: No Loyalty, Mandown, Zombies and Bullseye. All games are a work out and you’ll be running around, ducking, dodging and aiming for people and targets. I had no idea what I was getting into. I didn’t read any of the descriptions or watch any videos of it. Even though I went into the activity blind, I had so much fun. It does take a few shots to get the hang of of it but after a few rounds, I was shooting like a pro. Grab your family members or a group of friends and book your time slot on their website, you’ll surely have plenty of fun and laughter.